The Florist | Pub Quizzers | Find a pub quiz near you, now. 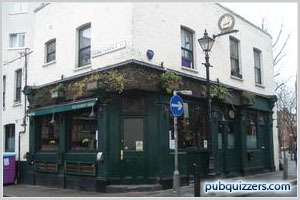 Pub quizzes take place at The Florist, Bethnal Green on Mondays (fortnightly) at 20:00. Entry is £1.00, you can have up to 8 people on a team. There are prizes of cash, drinks, food. Happy quizzing! Quirky quiz with amusing quiz master. Varied rounds to keep the mind ticking over. £20 for quiz winners, large jackpot for one lucky team. Gets busy, so make sure you get there early. Shots given to (un)lucky teams in 'plasticine' and play your cards right rounds. Suspended as of September 2016. "May return at some point"